Our Mid-Day Meal Programme has received immense support and we are deeply grateful on behalf of all the children whose lives have been transformed and continue to be. 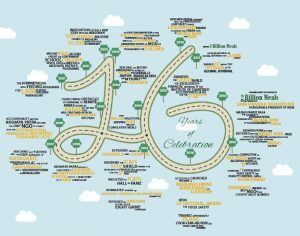 Today as we look back, we understand that internet and technology have played a key role in communicating our efforts and our initiatives. With the availability of advanced communication tools, reaching out to public for their support has been less of a challenge and more of an encouragement. 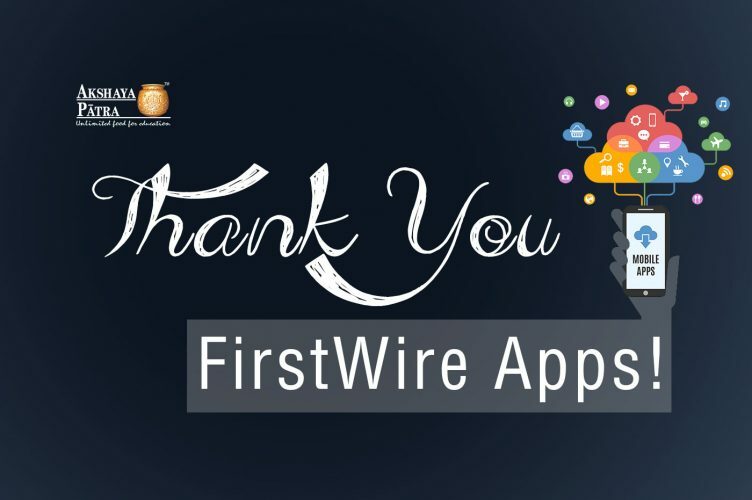 FirstWire Apps, a mobile application developer has helped us pro bono with developing an app for our official blog. With more than 100+ clients in blogging space alone, FirstWire Apps is committed to providing their service to a wide range of industries. To know more about their features, click here. Since 2010, we have been actively blogging about classroom hunger, food security, environment, educational rights, and in doing so, we have been inviting people to be a part of our perspective. Our words meet the eyes of readers via social media, website and of course, our blogging platform. With the new blogging app for Android users, we believe reading will be much easier! 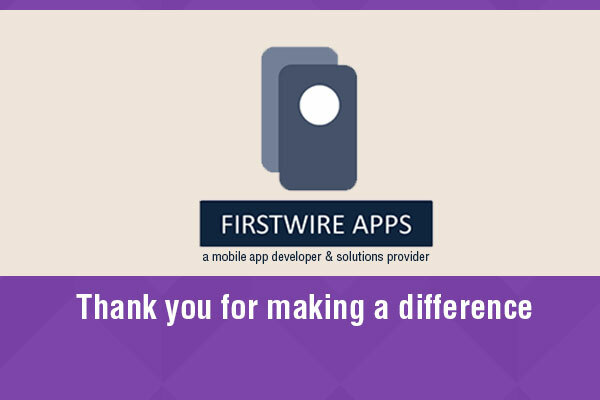 Thanks to FirstWire Apps for their hour-long efforts in developing the app and for bringing in this change. 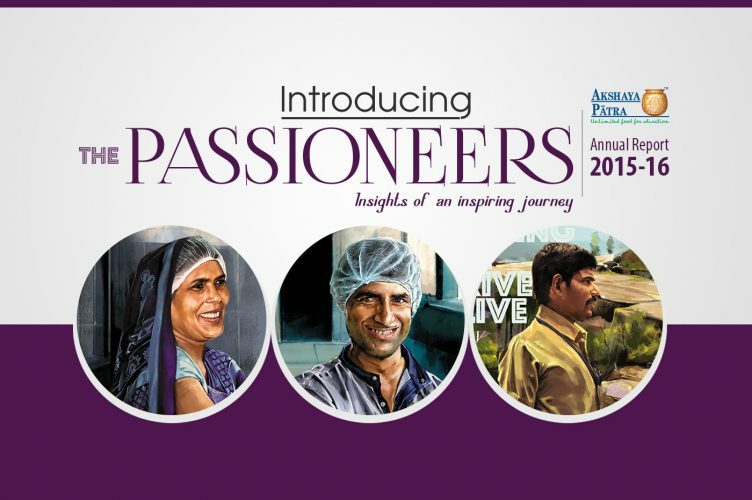 Akshaya Patra’s Passioneers are a tireless workforce! 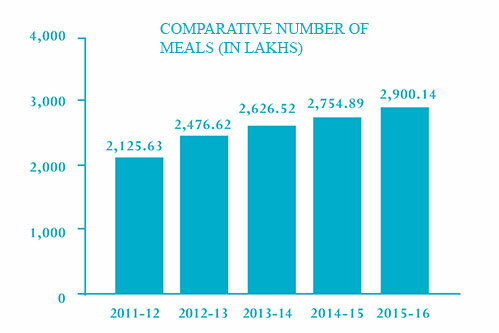 The year 2015-16 has been quite a special one for The Akshaya Patra Foundation. The organisation reached notable milestones, made new beginnings and received prestigious honours. The force behind the Foundation’s sustained momentum in serving the children of the nation, and its many achievements, is its dedicated workforce, toiling tirelessly behind the scenes, to serve its cause of ‘unlimited food for education’. 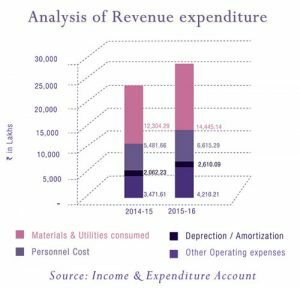 The Akshaya Patra annual report for 2015-16 unmasks and celebrates these previously faceless entities. Titled The Passioneers – Bound By Purpose. Driven By Passion, the report paints intimate portraits of people from the Foundation’s workforce, with beautifully done illustrations. These include stories of P Venkatesh in Ballari, who works as a driver, delivering Akshaya Patra’s food to the beneficiary schools; Meena Devi from Vrindavan, who cleans the crates, helps cut vegetables and cleans the dal. Then, there is Ved Prakash, who cleans the kitchen, the vessels and connectors in Vrindavan, along with handling many other processes. The annual report introduces us to many such employees, whose hard work and commitment has brought the organisation to its current position, where it stands tall and proud. 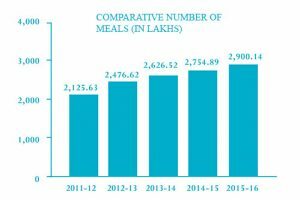 The year 2015-16 saw the organisation reach significant milestones, the biggest being the serving of 2 billion meals since its inception. 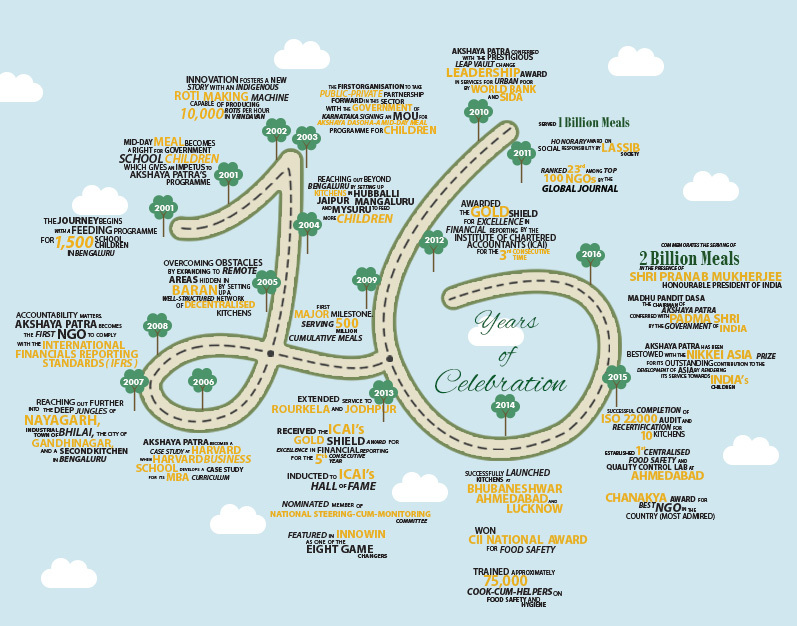 In the same year, its Chairman, Shri Madhu Pandit Dasa, was conferred India’s fourth highest civilian award – the Padma Shri. The report carries excerpts from an interview with him, where he speaks about receiving this prestigious honour and how it will provide an impetus to the Foundation. 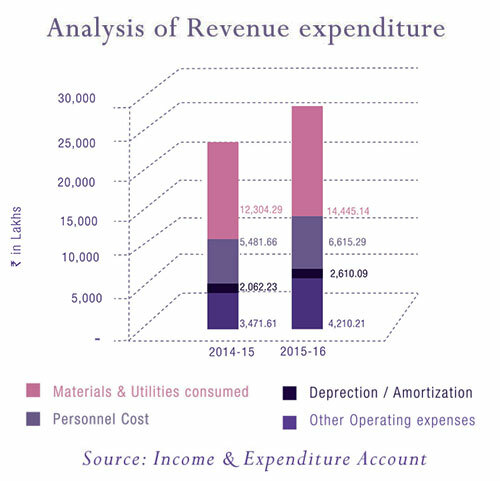 Looking forward, the organisation has numerous plans for the future, which are touched upon in the annual report. Among these are mobile kitchens or ‘kitchen on wheels’ for providing meals to disaster-affected areas, along with cluster kitchens in Uttar Pradesh and Hub & Spoke model kitchens. The future looks very promising for Akshaya Patra. The Passioneers celebrates the tireless hands that hold up the Foundation and have been steadfast in their support over the years. 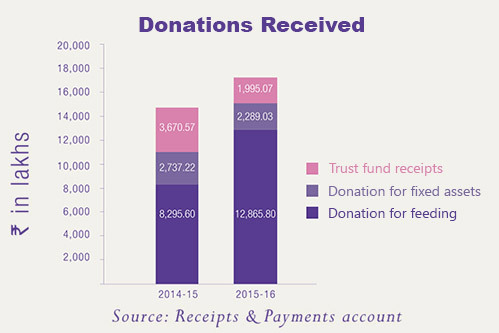 Read all about them at Annual Report 2015-16. 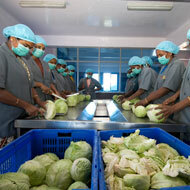 Akshaya Nidhi is a for-profit organization in the aid of The Akshaya Patra Foundation. 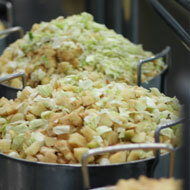 It provides lunch to workers employed by the industrial and corporate sector at a modest price. Recently, they paired with IRCTC (Indian Railway Catering and Tourism Corporation) to offer travelers the option of ordering a meal that will aid The Akshaya Patra Foundation on their mission to feed 5 million children in India by 2020. This new meal option will allow travelers to contribute to a good cause when booking their train itineraries. Currently, Akshaya Nidhi meals are only being served at Bangalore City Junction. The vegetarian menu includes: Curd Rice and Pickle, Puliyogare and Curd, Chapati and Sabji (vegetables), Bisi Bele Bath and Boondi, Tomato Bath (Tomato Rice) and Chutney, and Pulao and Raita. Prices range from Rs 70 to 90 with a minimum order amount of Rs 60. 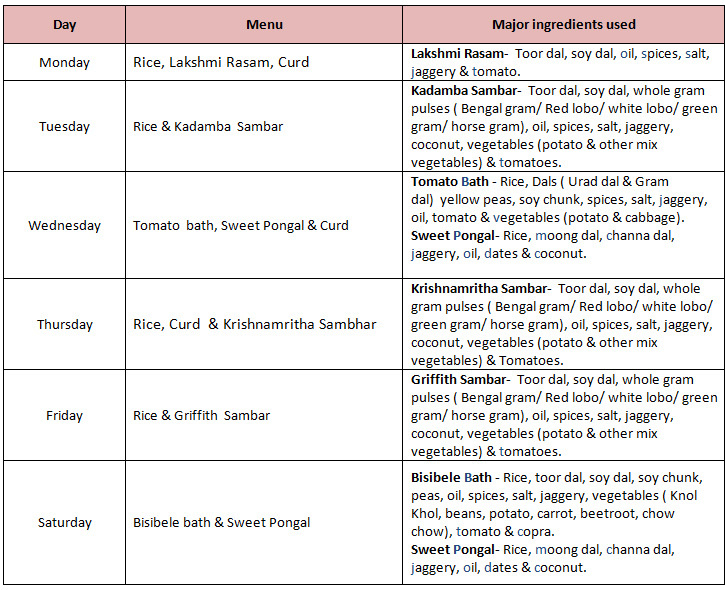 These were the first meals served by The Akshaya Nidhi Foundation and hopefully just the first of many to come. June marks Global Volunteer Month for Morgan Stanley, the global financial services firm. Each day for an entire month, its employees volunteer in their communities. Since the start of the initiative, its employees have delivered over one million volunteer hours in their communities. 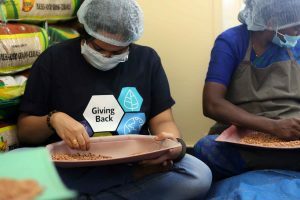 Recently, 25 volunteers from different departments at Morgan Stanley, Bangalore were able to spend the day at the Akshaya Patra VK Hill kitchen and the Uttari School on the outskirts of Bangalore. The volunteers spent the morning peeling coconuts, sorting grains, and unloading food before having the opportunity to serve the mid-day meal to the children. Morgan Stanley has been a supporter of The Akshaya Patra Foundation for many years, and we receive its volunteers multiples times a year. For some, it was their first visit to our facilities, but for others it was a chance to revisit an organization they support. More volunteers are expected to visit the Akshaya Patra kitchens and schools later this month. This photo blog is a visual inspiration for all those who are intrigued and fascinated by our colossal kitchens. This blog will give you an intimate look into an Akshaya Patra kitchen, with photographs of how exactly we accomplish feeding 1.5 million children daily! At each of our 22 kitchens, staff starts their daily ritual of cooking at 3am every morning. 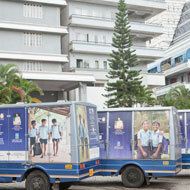 By 9 am, we have tasty and wholesome meals ready to spread cheer to millions of children across India. At 11pm, while the rest of India still slumbers, kitchen staff starts arriving at our facilities in batches, to kick-start the day’s cooking. Pre-processing activities include, kitting of raw materials from the production upon verification, grinding of coconuts, mixing of spices, chopping and slicing of vegetables and cleaning of raw materials. By 1 am, the boiler operations start. 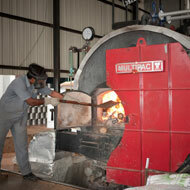 Briquettes are loaded into the boilers for generating steam. 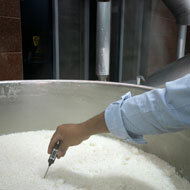 At 3 am, post the boiler operations and pre-processing activities, the core task of cooking starts. By 9 am piping hot food is packed in 304 grade steam sterilised vessels and our Blue buses are ready to whisk the gates of Akshaya Patra kitchens. Enter a child’s mind, find their dream, and guide the mind to its destination – a trail created by Akshaya Patra’s initiative ‘Giving Every Dream a Chance.’ When a child begins to dream to achieve something in the future, it becomes an orbiting thought with zero restrictions. However, when they are made to take a step back due to their economic conditions, they lock their aspirations in the mind itself. What children need at this point is immense support from the society, a great boost to dream fearlessly and an assurance that dreams do come true. With a belief that every dream deserves an opportunity, The Akshaya Patra Foundation has launched a project ‘Giving Every Dream a Chance’ to support the dreams of every child. This initiative will not only encourage the little minds to dream but will also act as a guiding star in getting a step closer to the dream. As a pilot project, three Akshaya Patra beneficiaries from Bengaluru went through a successful mentorship programme under the guidance of an expertise from their field of interest. Their stories highlight why it is important to give every child’s dream a fair chance. Shivu, a 14-year-old Akshaya Patra beneficiary, is fascinated by stars—a topic that makes our mind absolutely curious. Well, this curiosity is a driving force for Shivu to achieve his dream of becoming an astronomer. Akshaya Patra’s initiative laid the runway for his dream by providing a mentorship programme under the guidance of Ms Preeti Krishnamurthy, Senior Research Fellow in Astrophysics. During his mentorship, Shivu got an opportunity to have a closer look at the sky and study the celestial objects. Shekar built his dream of becoming a chef while helping his mother cook in the kitchen. To help him experience his dream, Akshaya Patra turned the 14-year-old boy’s dream into an opportunity by charting a month-long mentorship programme, where he developed his skills under the watchful eyes of Chef Ramasamy Selvaraju of the Vivanta By Taj. Manjula, an aspiring actress, is a star in her own right. What the 14-year-old girl needed was an expertise to polish her acting skills into a powerful one. That happened when Akshaya Patra decided to elevate Manjula’s dream by enrolling her in a month-long acting mentorship programme at the Bangalore School of Speech and Drama under the guidance of its Founder-Director, Dr. Zulfia Shaikh. After the successful launch of the initiative, The Foundation now plans to stretch the initiative to multiple cities across the country. It is our understanding that with right guidance, children will be able to realise their dream and also develop their skills. Join Akshaya Patra on the journey where hundreds of children from across the country will be benefitting from the initiative ‘Giving Every Dream a Chance.’ To help children dream fearlessly, the focus continues to be hunger relief among school goers through nutritious mid-day meals. By contributing Rs. 750, you can feed a child for an entire year! To help us achieve this, donate here. Global health threats are slowly engulfing everyone everywhere. Bit by bit the world is getting alarmed by teething health problems that are increasing mortality rates especially in children all over the world. In India the situation is alarming as its children continue to be in a state of silent emergency in terms of health indicators. It is reported that nearly 3,000 children die daily owing to malnutrition and one child dies every minute of severe acute malnutrition in India. Additionally India also continues to harbour one of the highest estimates of malnourished children in the world with a (Global Hunger Index) GHI score of (29.0). Hence Akshaya Patra like many other NGOs of the world is trying its level best to address twin issues of hunger and malnutrition by providing wholesome mid-day meals every school day. Our mid-day meals are designed in such a fashion that children automatically get their daily intake of fresh vegetables, dairy products, cereals, beans, legumes and oils imperative for increasing nutritional levels. However the manner of consumption also plays an effective role when it comes to providing the daily intake of nutrients and vitamins as children often do not consume the entire amount of food served to them at schools. This results in partial nutritional intake that further sustains malnutrition in children. Hence containing sensitivity to make food more desirable and nutritious at the same time, Akshaya Patra has designed a tailored menu for the various palates it serves. 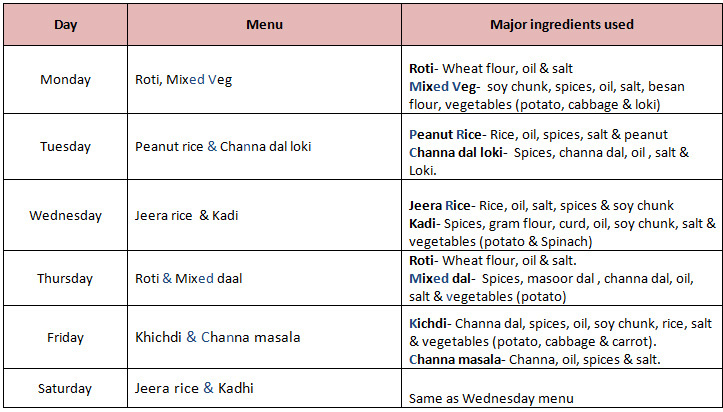 As one can see both the menus are robust combinations of fresh vegetables, cereals, carbohydrates, proteins, dairy products and essential fats, strictly designed under the guidance of nutritionists and food experts to address concerns of nutritional intake, food safety and food consumption in children. Akshaya Patra also makes a conscious effort to modify the menus on a timely manner so that children get more variety and a change of taste in terms of the food served. Children are also served fruits and sweets on special occasions that act as an incentive to their daily meals. Akshaya Patra undertakes this challenging task of feeding its 1.5 million beneficiaries every school day because it believes that a balanced diet is the only natural shed children can use to strengthen their immunity system and keep their bodies free of any diseases. In conclusion, ending malnutrition in India will not only reduce child mortality rates branching from several diseases and infections, it will also increase the overall effectiveness of the school lunch programme. Hence on this World Health Day, 2016 Akshaya Patra urges people to raise ample awareness about the pressing issue of malnutrition and its associated health risks in India. We are also of the opinion that community mobilisation and engagement of local youths and social workers can further pursue the cause so that together we can build a nation free of malnutrition for our children. On 11 March, 2016, a team of 20 female employees from SanDisk volunteered at Akshaya Patra’s Vasanthapura kitchen. 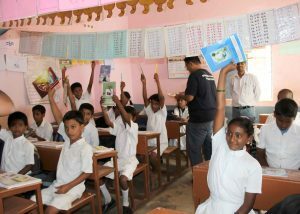 The volunteering was a part of SanDisk’s Corporate Social Responsibility (CSR) initiative. The volunteers arrived at the Foundation’s V.K. Hill kitchen at 10:30 A.M. After making them familiar with the guidelines, they were taken on a guided tour of the facility. Anilkumar T.B., AGM – Program Management, guided them through the entire process that’s carried out at this gravity-flow-based kitchen, right from the procurement process to loading of food containers in delivery vans. After the kitchen tour, they spent an hour in the processing area, where they helped Akshaya Patra kitchen staff in cutting and cleaning vegetables meant to be used the next day. They were brimming with enthusiasm all along. Thila, a software engineer at SanDisk, was particularly impressed with cleanliness and hygienic conditions maintained at the facility. Chaitra Thimmaiah, who was coordinating the event for SanDisk, said that the volunteers are very happy to be in Akshaya Patra’s kitchen. She mused that all of them were so enthusiastic about the whole thing that they wanted to spend more time in the kitchen and not leave so soon. 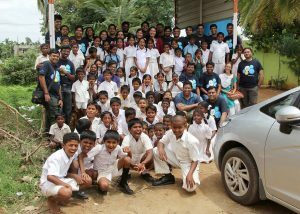 The next stop for these volunteers was Government Higher Primary School (GHPS), Kumaraswamy Layout. At the school, they interacted with students and served them sweets after lunch. The children were highly enthusiastic throughout the interaction and candid in telling what they plan to become. One of the volunteers, Upasana Gandhi said she was fascinated by this interaction with children, adding that she had never imagined that they would be so proactive. Another volunteer, Lopamudra Sen said she was impressed with the scale of Akshaya Patra’s Mid-day Meal Programme. She said she herself having studied in a government school, understood why Akshaya Patra’s efforts were laudable and that even she felt like joining the cause in some capacity. Lopamudra had first come across the name Akshaya Patra when she received mails from the Foundation asking for donation. Now, she says, she realises why these mails are important. On a parting note, Chaitra Thimmaiah described the experience as awesome. She also promised that the next time the number will be larger as they’ll make a conscious effort to spread the word. The ‘will’ to do something good is never an issue; lack of time is. At least, that’s what most of us have to say. If only there were 25 hours in a day, we wish. Imagine what wonders an extra hour could do. Alas, that’s not the case. The good news though, is that 2016 is a leap year, meaning we have a whole extra day for us. That’s as good as 24 extra hours in the year. So why not put them to good use? Well, here are a couple of things you could do, which will help us big time in our initiative. How about starting off with the simplest thing, say like our Facebook page. It will only take a second or two from your valuable time and help us reach a wider audience. In doing so, you’ll carry our message to all your friends and loved ones. We’d also like to hear what you want to say about our initiative. We do take Facebook comments seriously. If you are on Twitter, you should follow @AkshayaPatra and help us reach a wider audience. Your tweeting and retweeting will help us make our presence felt on Twitter. We need more people onboard, so why not start with friends and loved ones of our friends and well-wishers? The simplest way to contribute to our initiative is to spread the word in whichever way possible. So you don’t just need to restrict to social media; even word of mouth will take us a long way. A whole day with not much to do? You can spend some time reading beneficiary success stories. They are quite inspiring, mind you. Visit our Hope Stories website where we have documented the stories of our beneficiaries, school teachers, parents, and others involved. If you have a website or blog, you can simply place Akshaya Patra banner on it and help us spread the word. If we are to fight issues like hunger and malnutrition in India, we need to work together. We’d like you to partner with us to fight for the cause. If you are willing to lend a helping hand, we’ll be more than glad. You can just visit our volunteering opportunities page and browse the list. If an Akshaya Patra delivery van is a familiar sight for you, you can just snap its picture and share it on social media. So you have 24 options to choose from, none of which will take more than a day. In fact, most of them will only take a few seconds. The cumulative effect of your actions though, will definitely benefit millions of children.